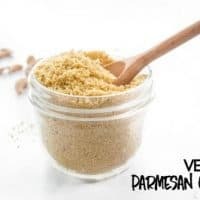 Vegan Parmesan Cheese is a simple vegan staple recipe you should always have in your fridge to top a variety of different foods. 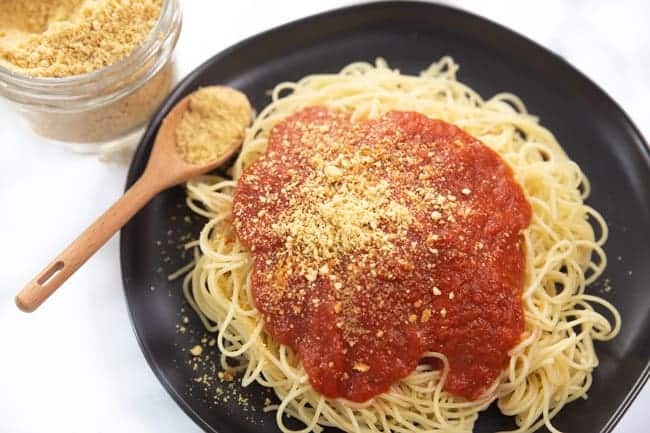 I’m not kidding when I say that vegan parmesan cheese is an absolute life-saving staple for my taste buds. I always have a batch made up and stored in my fridge, and I start to get a little anxious when it starts running low. The good thing is that it literally takes about 30 seconds to make, and I almost always have all 4 ingredients on hand at all times. I bet you do too! That’s really all it takes to make this magical “cheese” recipe. Of course, this isn’t a real cheese in any way shape or form. But you know the real Parmesan cheese that comes in the green container that you shake all over your pastas, pizzas, and really whatever comfort food your heart desires? Yup! 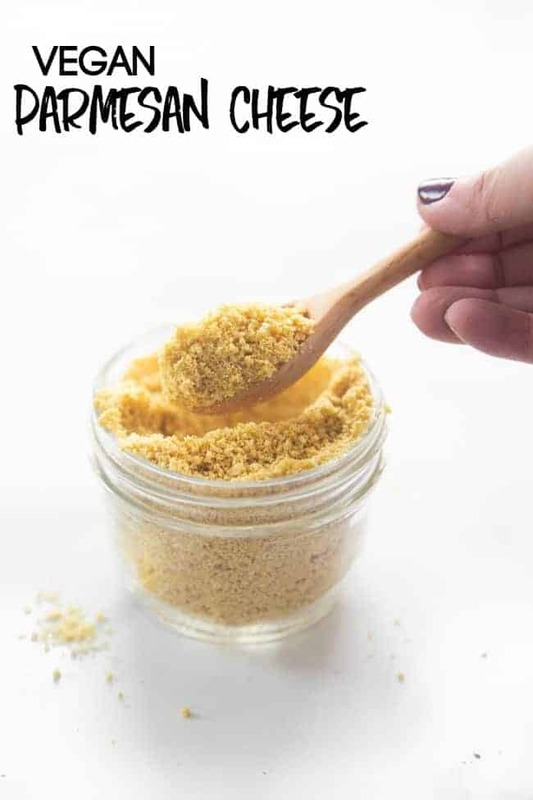 That’s what we’re going for with this vegan parmesan cheese recipe here. With vegan foods, a lot of people can feel like something is missing at times. I know my wife, who has always eaten non-veg food all her life, isn’t quite accustomed to eating plain vegetables or pizza without a hearty sprinkling of cheese. And dude, I’m right there with her! I have always loved cheese. Cheese is the reason I waited so long to actually make the switch from vegetarian to vegan. They’re perfect for enhancing new vegan recipes your taste buds haven’t quite gotten used to, making vegan life damn delicious! 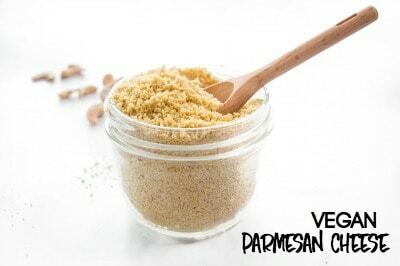 So back to this vegan parmesan cheese recipe specifically. You have the ingredients. You’re making pasta tonight. And you know you want to top that pile of pasta with a boat load of vegan cheese. Do you have time to make it happen while the pasta is cooking? Hell yeah you do! Let me tell you exactly how it’s done. Raw cashews in the food processor. 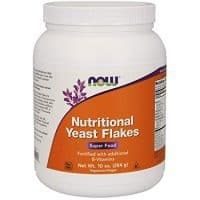 Nutritional yeast in the food processor. Garlic powder in the food processor. Onion powder in the food processor. Lid on the food processor. 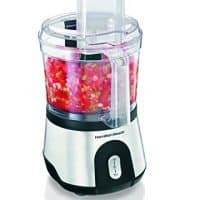 Pulse.Pulse.Pulse that food processor until you have teeny tiny little crumbs of cashews. You have absolutely no excuse for having this vegan staple recipe in your fridge at all times with a recipe as easy as this one. And cause I want to be sure you have all the info you may need, let me answer a few questions you may have about this vegan parm. 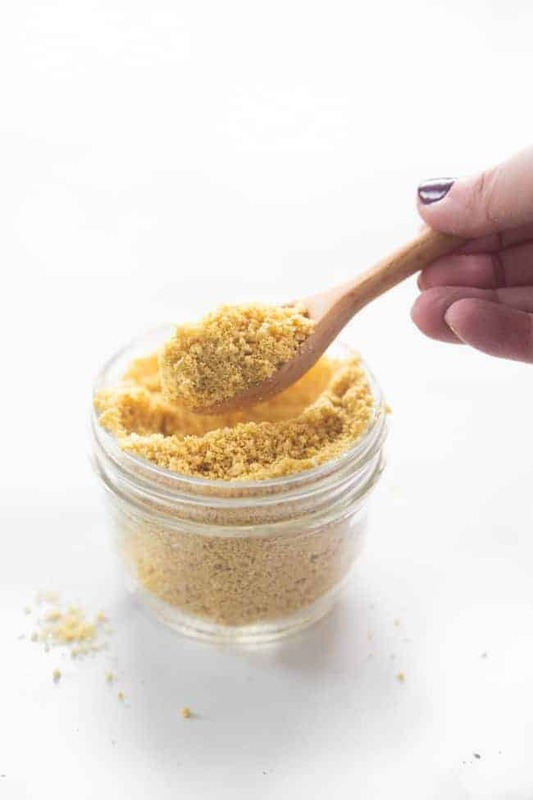 How long will Vegan Parmesan Cheese last in the fridge? I have kept this in a mason jar in the fridge for up to 6 months. I made a triple batch and it just lasted that long with no problems at all. How much will one recipe make? This will make about 1 cup of vegan parm. Can I substitute in another kind of nut besides cashews? 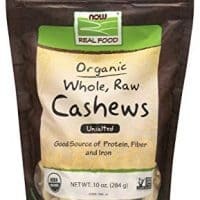 I have not tried this with any other nut besides cashews, but I know you could use almonds or walnuts and come out with a similar texture. The flavor will just be a bit nuttier. 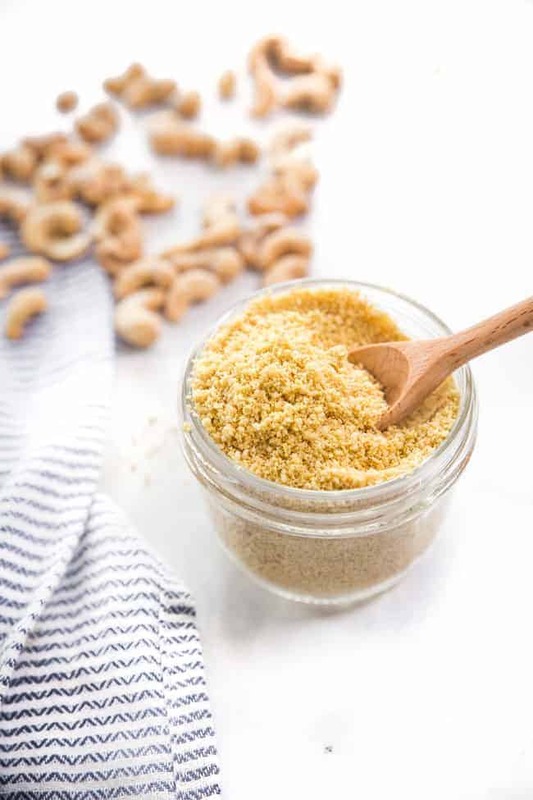 I like using cashews because they’re so mild in flavor and have the saltiness that real parmesan cheese has. Let us know in the comments if you try a different nut! What the hell is nutritional yeast? 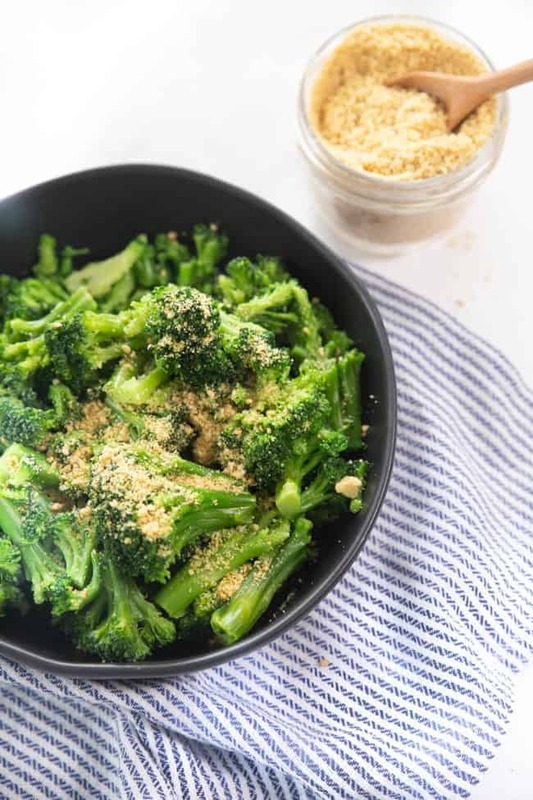 Nutritional yeast (or “nooch”) is such a weird one, but it’s a total staple in any vegan’s life. It has a “cheesy” or “nutty” flavor, which is what makes it appealing to a non-cheese-eater. But really, what is it exactly? FatFreeVegan explains it way better than I could. I’m always sure to buy a nooch that includes B12, as that’s one vitamin you’re unable to get from plants. What foods would you top the vegan parm with? Like I said, any pastas, pizzas, veggies, or even snack foods like popcorn or toasts. In fact, pizza is my favorite to load up with my vegan ranch dressing and this vegan parm. I don’t even miss the cheese at that point! 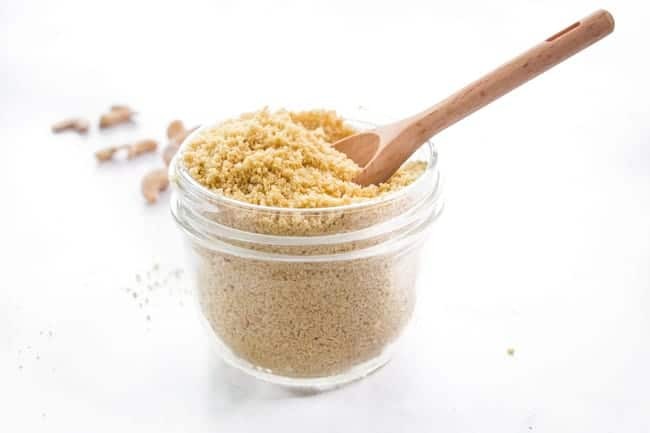 I hope now you feel confident enough to whip together this quick and easy Vegan Parmesan Cheese recipe for you and your gang. No more sad and boring veggies. 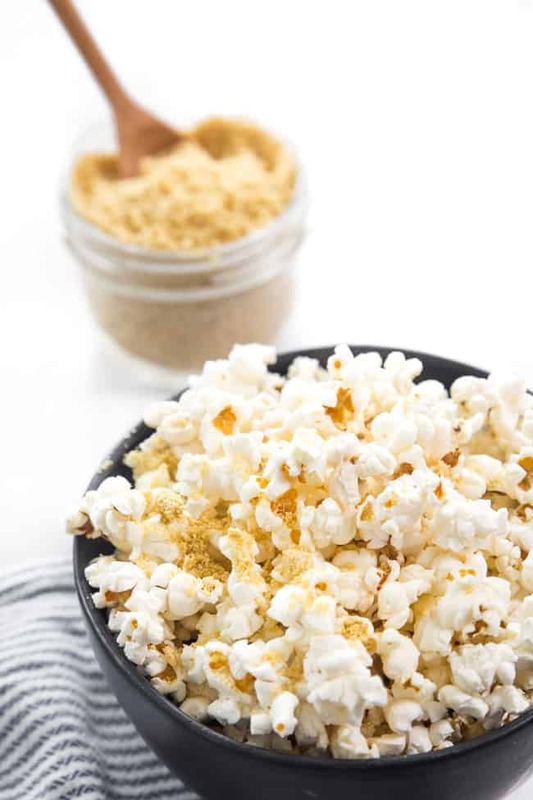 No more plain popcorn. No more cheeseless spaghetti. No meal will be boring with the edition of this parm. Post on Instagram (IG stories works too!) showing me how you’re using your vegan parmesan cheese and tag me (@happyfoodholly). I’ll be sure to share your creation! Add all ingredients into a food processor. Pulse for about 30 seconds until ingredients have all combined and cashews are chopped very small.